One of the true underground prog metal bands in Italy, Helreidh (one L) is resurfacing after an almost fourteen-year hiatus with the release of their new Fragmenta album. 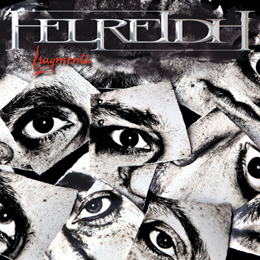 So, the Italian Helreidh is yet another one of those progressive metal bands that is neither great nor terrible. While Yorick (g), Luca Roggi (d), Max Bastasi (v), Aligi Pasqualetto (k), and Francesco De Paoli (b) pull of reasonably decent speed and subtle theatrical pick-riffing matched with a very crunchy rhythm section and symphonic keyboard section, it's the no commanding vocals of Max that entirely ruin it for me. Although the song writing and the execution of the material is flawless, the same thing has already been attempted and done by the likes of Savatage, Vandenplas and Kamelot though it never achieves the same dramatic depth. The song material is ok, ranging from ballads to dynamic rockers, and most of the time with all these elements within every single song, but then average lengths of six minutes leave enough room for variation. The album, while very long, never becomes pretentious, but there's also not that much originality here. Fragmenta is by no means a bad album, but we could have got something more original and special.